It seems that every time I make a fold back mitt, I get asked for a pattern. 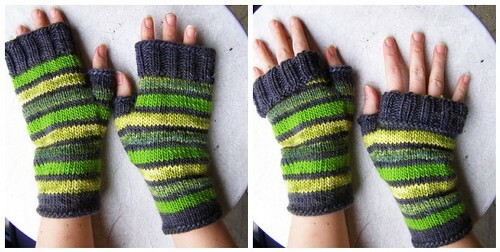 I made these as a commission for a Christmas gift and the recipient’s favorite color is, you guessed it, green! And I wrote down a little recipe for you this time. This particular pattern works best with one dark color and 1-3 other yarns that provide for some contrast in color and/or texture to both each other and the dark color. Place the strand between the two stitches on the left needle with the right side of the loop in the front. Knit through the back. Place the strand between the two stitches on the left needle with the left side of the loop in the front. Knit through the front. Work for 3 in. [7.6 cm], striping as wanted. I worked 4 row stripes with 2 row dark stripes in between. On the next round, place thumb where you would like it, paying attention to make the seam on the side or bottom of the mitt. When you reach where you want the thumb, place a marker, m1L, k1 stitch, m1R, place a marker, knit rest of round. On the next round, place the thumb stitches (the sts between the markers) on a piece of scrap yarn, casting on one stitch over the gap and joining to complete the rest of the mitt body. Finish by working 2×2 rib so that when the top folds back, it is to the length you would like. I worked around 2 in. [5.1 cm]. Place thumb stitches on double-pointed needles, knit 6 rounds and bind off. Repeat for the other mitt, sew in ends and enjoy! my project is raveled here. 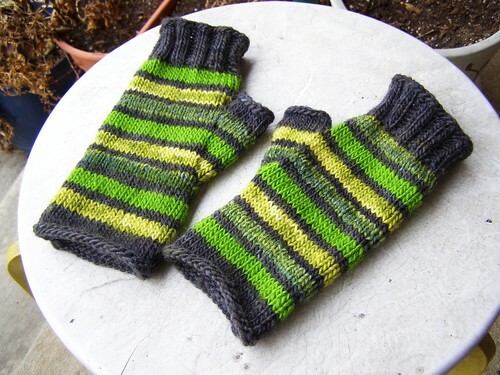 This entry was posted in cosyknitsliterally, free, knitting, mittens, patterns by cosymakes. Bookmark the permalink. cosy, thank you so much for the free pattern! Wonderful striping. It really blends well.